Winner of six Tony Awards including best musical, My Fair Lady sparkles with wit, elegance and romance, telling the story of an Edwardian cockney flower girl's transformation into the pride of London society. This beautiful production of My Fair Lady will transport you from the streets where you live to the flower markets of London, the racecourses of Ascot and to the glittering heights of an Embassy Ball where everything is 'Absolutely Bloomin' Loverly'. Musical numbers include On The Street Where You Live, Get Me To The Church on Time, Wouldn't It Be Loverly, With A Little Bit of Luck and I've Grown Accustomed to her Face. 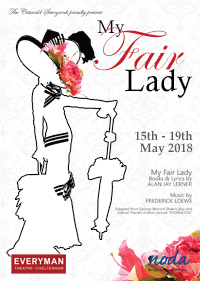 My Fair Lady is a jewel in the crown of the great musicals, written by Lerner and Loewe (Brigadoon, Camelot and Gigi) and based on Bernard Shaw's Pygmalion.